Examining 2nd differential of atmospheric CO2 concentration in relation to rate of change of surface sea temperature. Both datasets are filtered with a triple running mean filter with a zero pass at 12m , to remove the seasonal variations. A constant second derivative corresponds to a quadratic increase of concentration. This is probably quite close to being the case since a quadratic is similar to an exponential over short term (it eventually rises faster). In any case the two are almost indistinguishable over the period of the Mauna Loa data. 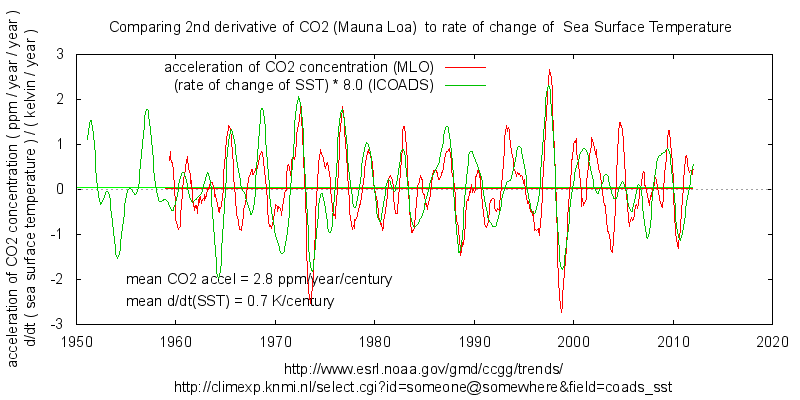 Since it is temperature that drives the rate of change of oceanic out-gassing of CO2, the acceleration of CO2 is compared with the rate of change of sea surface temp: d/dt(SST). It is clear that this relationship matches a large proportion of the variation across the full record. The residual “constant” of each quantity is found by taking the mean of the full record. This gives residual 0.7 K/century warming of SST and an acceleration of atmospheric CO2 of 2.8 ppm/year/century. Those are average values for the 50-60 years of data looked at here. The relative scaling (derived from the standard deviations of the two series) gives 1K deviation from long term average as producing 8ppm/year change in CO2 from the dynamic response. Hence a sensitivity of 8ppm/year/kelvin for inter-annual variation. Since surface water will react quickly to temperature change and the graph shows both quantities are basically symmetrically varying about zero, this can be regarded as deviations from the dynamic equilibrium value. 2.8 / 0.7 from the long term averages gives about 4 ppm/year/kelvin , as the inter-decadal ratio. About half yearly value, that will include out-gassing and residual anthropogenic emissions not absorbed by the biosphere. The value of 4 ppm/year/kelvin is close to the approximate inter-decadal value obtained by visual inspection of the first derivative of CO2, linked above. The faster, inter-annual variations will be occurring in shallow surface waters of the mixed ocean layer. The long term change will involve larger volumes of deeper water with lesser variations in temperature than the surface layer, so the two results are not incompatible. This suggests the 8ppmv/K/a figure is applicable to the top 30m or so of the “mixed layer”: . The temperature derived from Tornio River (Finland) break up time series gives has mean rate of change 1.1 K/century over three centuries. There is no apparent long term drift in rate of change, ie it shows no acceleration.